Inbox2DB collects the data from incoming email messages and adds a new record to your MS Access database for each message. The access database can be on your local computer or on your network ... it's no longer required to use an online database to process data entered on a web site. The MS Access database can be freely designed by you - there are no mandatory columns or data types. 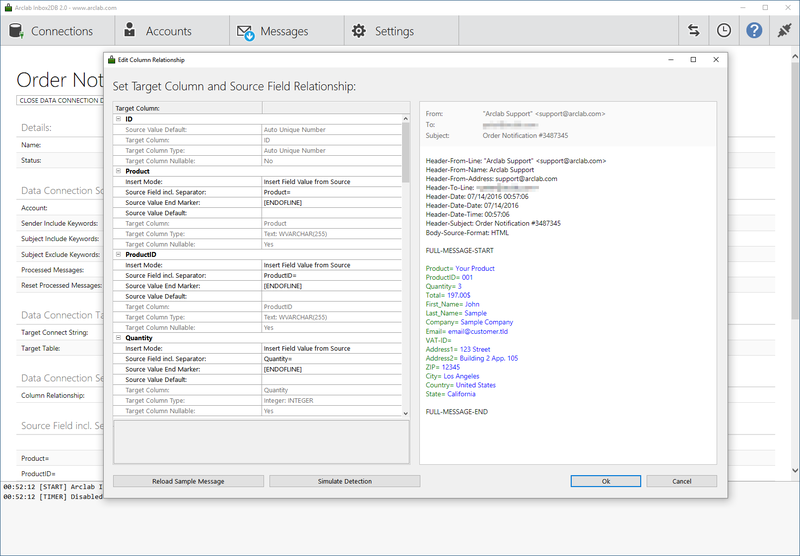 All you need to do is to map the source fields of the email to the corresponding database columns using a sample message. The "Simulate Detection" feature allows you to verify all settings based on the loaded sample message. Inbox2DB can process incoming messages by request or using a timer (e.g. every 30 minutes), depending on your workflow. It runs on your MS Windows based computer and works with any regular email account using IMAP or POP3. The unique features of Inbox2DB and the flexible collection engine allows you to process any type of structured message, e.g. created by a web form on your web server. You can use any type of form mailer, contact form or other script which generates an email. The data included in the email message will be mapped to the data type of the access database automatically, so you don't need to care much about data types. It supports U.S. and European input formats, like e.g. 24/12/2014 and 24.12.2014 as date, $1.99 and 1,99€ as currencies, etc. The MS Access ODBC drivers are installed during the program installation. It's not required to have MS Access installed on the computer running Inbox2DB. Test Arclab Inbox2DB using our trial version for 14 days without limitations.